Lurkers, Leeches, and Lesbians perhaps? This has been on my mind for a while, so I'm finally being brave and saying something and we'll see where it goes from there. I skim the pages of this forum and most of the threads here get several hundred, or even several thousand views, but unless a topic really gets going, there aren't too many replies that come in and most that do are from the same small handful of users. This tells me that there are a lot of folks interested in the content (great) but for whatever reason not eager to make their known (not great). I don't mean any ill will by using the terms Lurkers and Leeches btw - just wanted an attention grabbing headline. I've heard from people that they don't want to get in the way of the experts - but how do you think any of us got to be what could be described as 'experts'? In a similar vein, I've heard some people don't want to ask dumb questions - but I think the only dumb question is the one not asked. I can say with certainty that I have learned several things over the years about the F1 myself because questions people have asked that shine light on new info or offer a different perspective. Even for someone who is often accused of knowing everything (for the record, I don't) investigating the answer to people's questions or comments in the past has caused me to look at things a little closer and occasionally learn something new in the process. I've heard that people don't want to say the wrong thing when someone else might have the right answer - but generally most here are very polite with their corrections and you'd have to be a serious troll to get something different in return. Plus, if you do have the wrong answer, wouldn't you want to have that corrected? I certainly would. I've heard that people don't want to post something only to be told that it's a repost too - but the search feature actually works really well here if you haven't tried it yet. I bet I use it a couple of times each day with good success. Some people even PM or email me in advance to find out if something is new, so if you are worried about this feel free to take that approach. 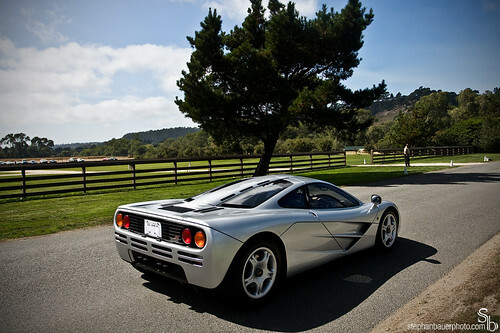 I believe everything needs to be posted at least once for this forum to continue as the greatest web-resource for the McLaren F1. I'd hate to think we might miss out on content just because someone worries about posting something we may have already seen. I've heard some people just like looking at the pictures - well, me too. Can't argue that one I guess. BUT - it would be great for those who are enjoying the pics to pop in every once in a while with a little "Thanks" to those of us taking the trouble to find or photograph or scan and share them. Often that exercise takes quite a bit of time and effort or comes at some expense. I've also heard that some don't do well with the English language which is predominantly what we use in here. I have found that the web translation software available now is pretty accurate, and we'll certainly be courteous if we see people have a bit of a language barrier. I read some forums myself where the discussion isn't in English using that type of software-assist, and have also commented in posts after translating what I want to write back into their language. It's not perfect, but gets the job done. Anyway, since there must be more than a few people who look around here but don't post, this thread is an invitation to say 'hello' and introduce yourself; say 'thanks' if you want to, maybe explain what interests you most about the F1 and what sparked that interest - pictures/articles in magazines or the internet, a race you attended with GTRs on track, a first-hand experience with the F1 somewhere, a particular video featuring the F1? All of those things helped to fuel my passion for the F1 between the years of 1991 and 2003 - and now 7 years later look at where we are. Maybe you worked with the cars in some capacity - I know we've had a few people come through with that experience and they've contributed some of the best first-hand accounts we've had the pleasure of reading. They've also helped to solve several mysteries along the way. We could use your help too in some aspect, I am sure. Maybe you are a current or former owner - hopefully one that everyone says nice things about in here. I can promise that while the enthusiasm level has been known to shoot through the ceiling when an owner openly comments, those threads end up being some of the better ones we get. Of course it's easy to realize many of you don't have the time to devote to a thread like Mr Selldorff did, but we'd still like to hear from you too even if you don't plan to be a frequent poster. BTW -If you are already what could be considered a 'regular' feel free to do the same with that intro request if you'd like. Everyone is going to have unique and interesting reasons for being here. My big hope is that this thread will break the trend of < 10 replies with > 500 views at least this one time, and then perhaps bring some of you out into the open and encourage you to post more often too. Re: Lurkers, Leeches, and Lesbians perhaps? I want to thank all of you experts (you guys really are) for continually feeding my obsession. Don't worry, I won't blame you when it gets dangerous. More seriously, I want to thank Peloton25 for posting his top 125 or so pictures of McLaren's on the Luxury4Play website. This has provided me with years work of desktops. I'd also like to thank him for his F1 ride story, it gives me hope. I'd like to thank fselldorff and flemke (from Pistonheads) for giving us hopeless dreamers a peice of heaven. And Sauc3; I'd like to thank you for wasting several hours of my life with your wonderful scans. I live in Sarasota, Florida. For those of you unfamiliar, this is about 1 hr due south of Tampa, and 3 hours NW of Miami. I have grown up with the McLaren F1, some of my earliest memories are of playing with a 1:12 model. Some of the best memories of my youth are racing the McLaren in various video games (NFSII; i'm looking at you). Yet I haven't ever seen one, not even been passed by one on the highway. So my question: where is teh nearest, and earliest, possible, and economically feasible, place for me to go to spot one? Your post has reminded me that the 'Top 125' set could use another update - its been about a year and a half now since I pulled those together and there's more good stuff that belongs in bundled collection like that. In due time I guess. Lots on my to-do list. LOOKIE WHAT I SAW TODAY!!! On my way to work. I was like "Is that...? it can't be...! no way...! GET OUT THE ****ING CAMERA!!" Talk about a rare thing to see. Location: Sarasota FL at the corner of N Washington and University Parkway. This car wasn't too far away from Heffner. Wonder what's up. Unfortunately, to my knowledge the car has not been spotted anywhere at all since then. Much like McLaren's Customer Care department, we here in the F1 forum like to see the cars about once every nine months or so to know they are okay and still in the same spot. Any longer than that, and it can be anyone's guess where they are today. Now hopefully it doesn't drive you mad thinking there is one that close by, but it might not hurt to ask around if you have any contacts that might know about this car, or at least keep your eyes open. Other than that - Monterey, CA remains the best place in North America to attempt to see an F1 each year in August. Four out of the past five years, there has been at least one F1 in town. They aren't always publicized in advance, but if you hit the major locations you could have a good chance of finding one. Otherwise, you'll enjoy everything else you do see and so the whole trip won't be for naught. I am not aware of any that are on publicly-accessible permanent display right now, or in a dealership anywhere in the USA. Miles Collier's #022 is the only other one that is close by you to my knowledge, but you have to make special arrangements to get into the Collier Automotive Museum these days and they don't allow any photography inside. Last edited by Peloton25; 01-26-2010 at 05:43 PM. I've been visiting the F1 forum here at least once or twice a week for the last seven years. I post occasionally but mainly I'm here to read from the "experts" and enjoy the posted images. A big thank you to all and cheers to another seven years. P.s. Eric, where's your signature image from? /thumbs up on that one. That was really needed post here! I recognized my self many times reading your text. I remember clearly when I first time openned this Forum, I got a link that Finish F1 Forum. So here I was, absolutely muted all those stories, images, pics, articles. I didn't knew where to start. I didn't knew really nothing else, a road car, LM and GTR. And J.J Lehto drove black Ueno Clinic 1995 Le Mans, and won it. And he raced Longtail GTR on year 1997. Fortunately I'm not a shy these things, so I read this forum one..two days and then gather my courage and posted here first time, not so good English and questions which were simply and 100 times asked ones. I misunderstood some times and asked it again, diferent words affraiding that someone might bet agry to me asking those things many times. But then, Greg and You, and many others that days just an over an year go helped me. Greg aswered my PM's constantly back and helped me work clear image what is this thing called F1, LM, GT and GTR. Fortunately I had background informations, but specialy the racing side was completely new me. All those chassis, liveries, races, drivers, and then came those scale Models and again same 100 question per week started. And today I have new friends, Le Man, DocGTR, have been helped me alot my questions and wonderings concerning all thins on F1, mostly GTR's. What I'm trying to say here, I never expected to have such as welcome here. This F1 area. The people here have been amazing, helpfull and day after day given their answers even very common questions. It might be easy to react that "find it your self, I don't have time to this". BUT NO. Never has happened this way. It just has meant me alot, I appreciate this very high. I even thought, writing here with my own name would give more serious imagination of me, I'm not joking here. I have found my allready forgoten enthusiasm about F1 and specialty GTR's, which I have allways loved everyway, just didn't knew where to look for. This simply has been absolutely Superb Forum. So Thank you very much for your all here!!!! I mean it! And....if here really is someone who is reading this but just don't dare to ask, please forgot those feelings and ask. Only way you can learn is ask if there is something wonders your mind. I tryed it and never regret that first post day to hear. "...JJ Lehto was awesome during that night long, treacherous night.At times he was 30sec a lap quicker than anyone else..."
Kuvat.fi -McLaren F1 GTR and many others! Welcome back! Thanks for poking your head in again - I do recall when you'd have qualified as a regular. Yes - new signature is made from a BEAUTIFUL image of chassis #068 by my friend Stephan Bauer. In fact, I feel bad cropping it like that. Here's the original - click for hi-res. The #01R shot I had was getting a bit stale so I needed something new. I wondered who might be the first to ask about it. Thanks Sami - your reply was great too. Glad you have found this forum so beneficial. I thought McLren F1 has been forget, but it's feeling better than ever! Thank You Erik for the good starting post! Maybe it should be always on the top of the thread list, for encouragement. I shall take my opportunity to thank all the contributors here for making this forum such a good place to hang around! This massive database here on these wonderful cars wouldn't have been possible without the contributors and the rich discussions. Even though I gathered during the years much of knowledge of these cars from many different sites, books and other places, this forum has been much of the glue to put that all together. Let's keep it going strong! I like the new signature Erik, Stephan had forwarded that to me on FB - its truly a great picture (now my screen background, replacing one of the Mantide@ Goodwood). I do hang out here and learn interesting stuff on a regular basis, haven't posted before but am active on other forums. I often say "thank you" for your passion of enthusiasts there. The F1 is alive and the forum too ! It's great compared to others supercar (GT1, CLK-GTR, XJ220) which produce less interest. it's more difficult to have informations about actual localisations particularly, the factory doesn't exist today instead of McLaren automotive. I hope I am clear This forum learn me so much things. Bravo ! Wow. 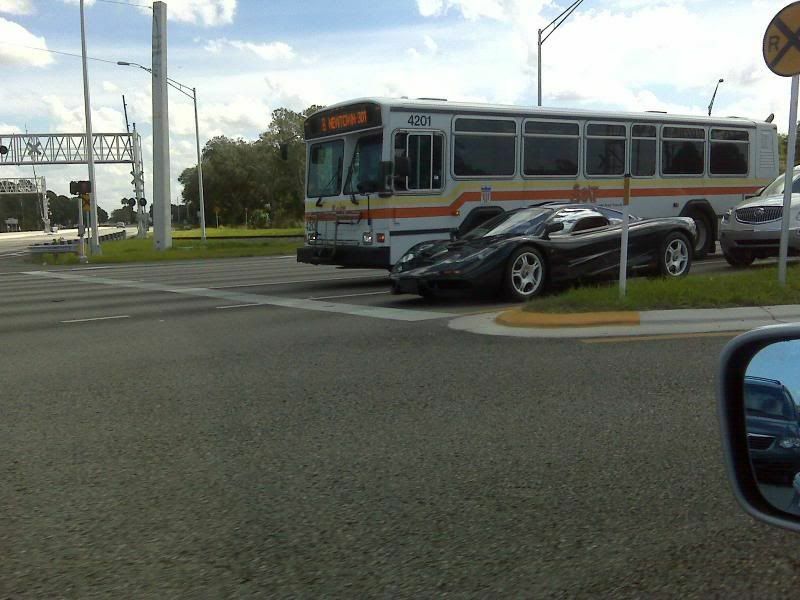 I had been told at one point that there were McLarens in Sarasota, but having never seen one I didn't believe it. That interesection is less than a mile away from where I am now. Thanks for the 'hello' and the photo. I'm sure I speak for everyone here when I say thanks for affording us the opportunity to follow along this summer via the web and then with the later recap in Automobile Magazine. It was an exciting/daring/unique trip you gentlemen arranged and of course came with great memories to last a lifetime. It's exactly how the cars should be used. The lap at Bruntingthorpe looked great too. Last edited by Peloton25; 01-26-2010 at 05:44 PM.